Listing of the patterns in the book. Several sample patterns from the book. Neal Ford, Matthew McCullough, and Nate Schutta sat down four years ago at a table and discussed how to collect, write about, and share the knowledge of many presenters with the world of occasional and frequent presenters. 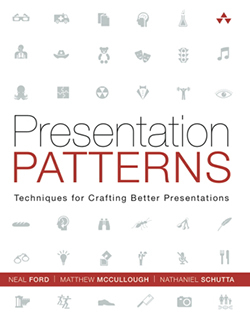 The result is this book: Presentation Patterns. Improving every aspect of a seemingly soft skill such as presenting is difficult to act on when the suggestions are abstract. Patterns provide a series of steps and implementation details that make presentation improvement easily actionable. Presentation Patterns is a book of over 100 recipes that provide actions to perform and avoid and context as to why you should or should not perform. The book is divided into three major sections: Prepare, Build, and Deliver. This allows readers to drill in, even with a presentation deadline looming, and improve the content and impact of their talk via actionable and bite-sized instructions.